If you have ever noticed white spots or streaks on your nails, you may have been told they were caused by a vitamin deficiency. However, that probably isn’t the case. Vitamin deficiencies take a long time to manifest symptoms, and those symptoms typically include pale or yellowish skin, a swollen red tongue, weight loss, and diarrhea. You might also feel confused, dizzy, tired, or weak. So if white spots on your nails are not typically a sign of vitamin deficiencies, what causes them? Should you want to learn more about what causes white spots on your nails, just ask FastMed. Our online medical library can provide you with information on various medical conditions, including conditions that affect the nails. What Causes White Spots on Your Nails? The white spots on your nails are probably due to an injury you sustained months ago. As your nail grows out, white spots can show up in places where you injured the nail or nailbed. The injury doesn’t have to be major, or even noticeable. Simply hitting your fingernail against the edge of something, like your car or a table, can cause white spots on your nails to appear. Sometimes white spots on your nails can be a sign of an infection or allergic response to something. There are some cases where white spots on your nails indicate that you have a vitamin deficiency. Eczema and psoriasis can cause white spots on the nails, and they are often due to lack of zinc. If the white spots on your nails are caused by an injury, the only way to get rid of them is to let them grow out. If you suspect that the white spots are caused by a zinc deficiency, try to incorporate more zinc into your diet, or you may contact a medical professional for advice. If you would like to be seen by a physician for white spots on your nails, or any other nail problems, visit FastMed Urgent Care. 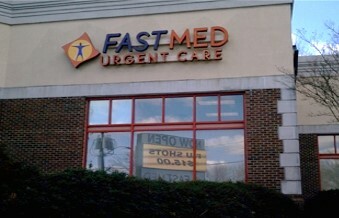 Our mission is to provide our patients with fast, high-quality personal care–all at an affordable cost.